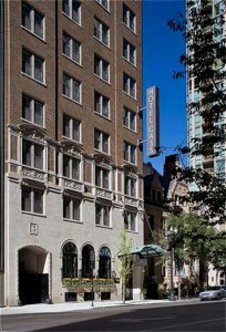 The new Holiday Inn Express Mag Mile - Hotel Cass has 175 guest rooms, including 3 suites and features approximately $16 million in renovation scope. The public area relates to the historic, 1920's Beaux Arts' architecture and features a great room including comfortable seating areas for the complimentary full Fresh Start breakfast including hot items such as scrambled eggs, omeletes,bacon, sausage and biscuits and gravy. Also in the great room are amenities such as a fireplace and plasma television. Guest rooms feature 32' flat panel televisions, working desks and a simplistic design aesthetic that emphasizes clean, contemporary styling with carefully placed decorative details relating to the public areas. This hotel is committed to providing accessible facilities under the American Disabilities Act. If your accessibility needs are not met, please contact the Hotel Manager on Duty. Should you require additional information regarding accessible facilities for guests with disabilities, please call 1-800-Holiday (U.S. and Canada) or contact the hotel directly. For the hearing impaired, TDD service is available at 1-800-238-5544 within the U.S. and Canada.